Some of Bespoke Yacht Charter’s favourite self-drive road trips are located not far from the French Riviera’s ports and marinas meaning a spectacular journey on wheels is easy to combine with your Cote d’Azur yacht charter – imagine rambling into vineyards to buy wines direct from the producer, visiting perched villages for a leisurely Provençal lunch beside a heritage-listed fountain and traversing beautiful National Parks with wildflowers and wildlife. Monaco, the second smallest independent state in the world after the Vatican, has a big reputation as a place of Chanel and champagne, palaces and Grimaldi Princes and superyachts alongside supercars. Read our Tips for Yacht Charters in Monaco so you can be sure to experience the best from this glittering Principality! As the weather turns autumnal, a road trip in a convertible might not be top priority that is, unless it’s to have a spin in the new Huracan Spyder sports car, launched in September by Lamborghini. This head-turning roadster was the star attraction of the Frankfurt motor show, where it was unveiled by Lamborghini’s CEO, Stefan Winkelmann, at the VW group preview night. More formally known as the Lamborghini Huracan LP 610-4 Spyder, due to its metric horsepower output and its four-wheel drive, this sensational supercar succeeds the Gallardo Spyder, to date the best-selling open-top car in the manufacturer’s history. However the Gallardo Spyder’s success is not expected to last. “We expect the Huracan Spyder to exceed its predecessor in every way,” says Mr Winkelmann. What’s so special about this particular soft-top supercar? It’s 5.2-litre V10 makes 610 horsepower at 8,250 rpm and 413 pound-feet or torque at 6,500 rpm. The ten-cylinder engine torpids the Spyder from zero to 62 mph in 3.4 seconds and has a top speed of 201 mph. But it is not just the wheels on the roadster, which turn superfast. The Huracan Spyder also has a fabric roof, which is electrically operated at speeds of up to 31mph. According to its manufacturers, it takes just 17 seconds for the soft top – available in black, red or brown – to disappear behind a discrete cover. The interior of this sensational new Spyder is very similar to the Huracan coupe, although it does benefit from innovative ducts that reduce air turbulence in the cockpit, as well as detachable glass rear windows. These lateral wind guards allow the driver and his companion to talk even when the top is down, or can be opened to let the guttural sounds of the engine pour into the cabin when the roof is on. The Lamborghini Huracan LP 610-4 Spyder is, like its coupe version, a four-wheel drive with the driver being able to choose between three driving modes – Strada, Sport and Corsa. A simple switch of a button on the steering wheel, known as Anima (advanced network intelligence management), will allow the motorist to select the mode he wishes. The Huracan Spyder, which has been built out of aluminum and carbon fiber ensuring it is as light as possible, is scheduled to go on sale next spring for approximately £205,000. If this has wet your appetite to drive a Lamborghini, Luxury Car Rent has three from which to hire: An Adventurer Roadster, an Adventurer Coupe and a Huracan LP 610-4. Luxury Car Rent hire elite, supercars in Monaco, the French Riviera and the Alps. You can also reserve the new Lamborghini for 2016, or perhaps a new Mercedes or Ferrari, from Luxury Car Rent, in Cannes, Monaco or Saint Tropez. The French Riviera is famous the world over as the summer playground of the international jet-set and celebrities. From the beaches of St Tropez to the exhilaration of the Monaco Grand Prix, here are 5 Things You Must Do On The French Riviera! The most famous race on the Formula 1 calendar takes place on the streets of the Principality of Monaco during the last weekend in May. Whilst the race may not appeal to racing purists, there is no doubt that this is a spectacle not to be missed. For five days, the F1 circus completely takes over this glamorous micro-state. 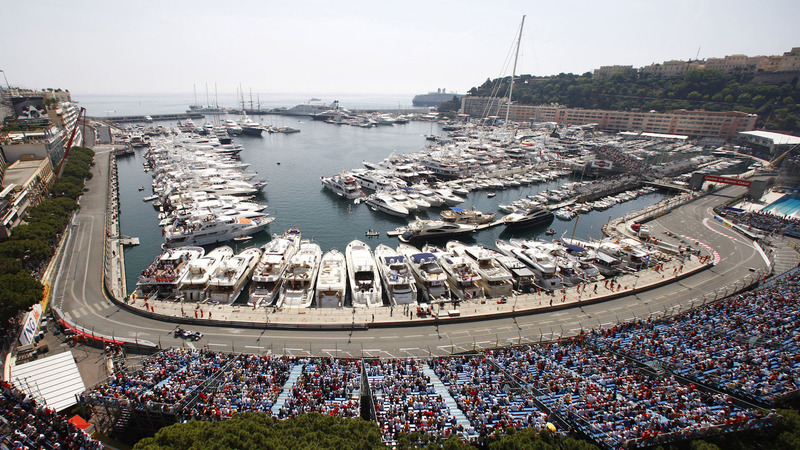 The race itself can be watched from various stands around the circuit or from the balconies of hotels and apartments trackside, but the ultimate way to experience this legendary event is from the deck of a luxury yacht berthed in the Port of Monaco! Imagine the fastest cars and drivers in the world flying past at huge speeds, literally metres from you, whilst you sit on the deck of a glamorous superyacht experiencing some of the finest service and cuisine known to man. If you are lucky enough to be on a yacht charter at Monaco Grand Prix, you’ll also experience some of the best parties that take place on GP weekend. Also be sure to visit Amber Lounge, the star studded club owned by Sonia Irvine (sister of former Ferrari driver Eddie) that sets up shop in Monaco each year for the Grand Prix. Book a table and mingle with drivers past and present and the world’s international jet-set! You simply haven’t lived until you’ve stayed at this temple to all that is luxurious on the stunning Cap d’Antibes peninsula, between Nice and Cannes. Set in stunning landscaped gardens with panoramic views of the Mediterranean, the hotel consists of two distinct parts, the palatial Hotel du Cap and the seafront Eden-Roc pavilion. Both buildings feature lavish rooms and suites offering the ultimate in luxury and unparalleled standards of service. Dine in the fabulous Eden-Roc restaurant, recently voted as one of the 100 best restaurants in the world by Elite Traveller, or at the more casual but equally glamorous Grill by the pool. Sip cocktails on the terrace of the hotel’s fantastic new champagne bar, or pamper yourself in the divine Sisley Spa. 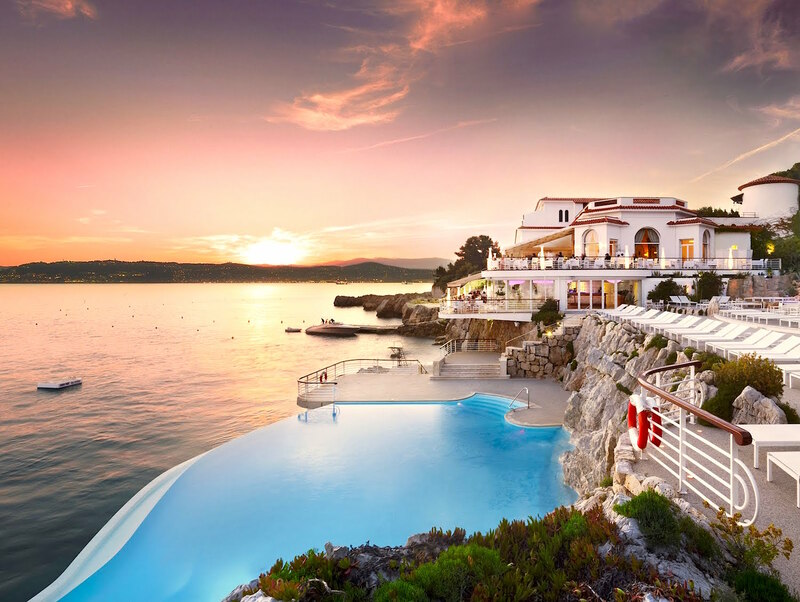 This hotel is incredibly famous, and not just because it is here that stars flock during the Cannes Film Festival, the Hôtel du Cap-Eden-Roc is truly the definitive luxury hotel experience on the French Riviera and one of the best hotels to be found anywhere in the world. The French Riviera is without doubt one of the most beautiful places in the world and what better way to appreciate it in all its’ glory than to see it from the air! You get some amazing views from your plane as you come into Nice Airport, but to really appreciate the amazing scenery of the region, you need to get into a helicopter. 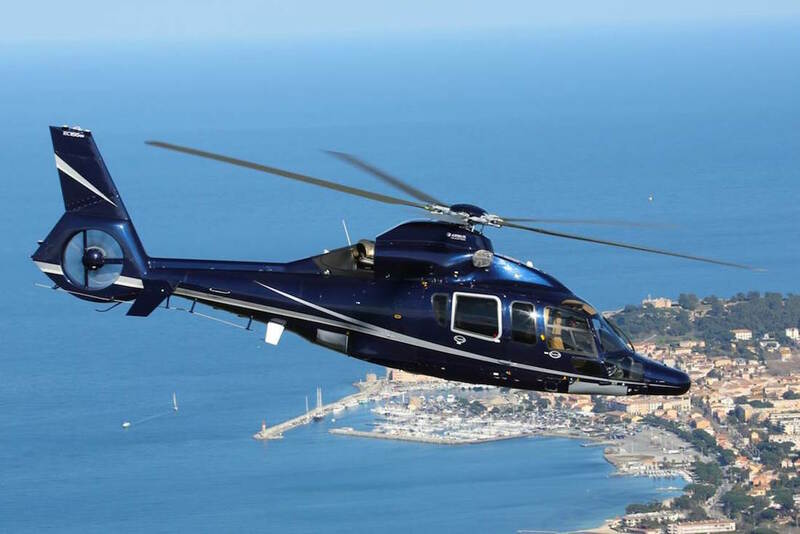 Regular helicopter flights operate between Nice Airport, Monaco, Cannes and St Tropez offering stunning views of the Côte d’Azur and reducing journey times greatly. It can take hours to get from Cannes to St Tropez by road in the middle of the summer, by helicopter, it takes less than 20 mins and offers fabulous views over the Esterel mountains. The helicopter service from Nice Airport to Monaco takes just 6 mins! It’s also surprisingly good value at €130 per person, only slightly more than a single taxi fare. Luxury yachts are synomous with the French Riviera, but you don’t need to be a billionaire to enjoy one! Yachts of all sizes can be rented for the day, week or longer and there is something to suit (almost) all budgets. From a 20m motor yacht for the day to a 50m for a two week family holiday. As one of the most famous stretches of coastline anywhere in the world, it goes without saying that the very best way to experience the French Riviera is from a luxury yacht charter. Imagine arriving in such famous ports as Cannes, Monaco and St Tropez on your very own yacht, with a crew there to spoil you, and only you. No other method of travel offers such sublime luxury, privacy and the possibility to have breakfast in Antibes, lunch off Cap Ferrat and dinner in Monte-Carlo! All luxury yachts are fully crewed and offer service equal to that found in the world’s finest hotels and restaurants. 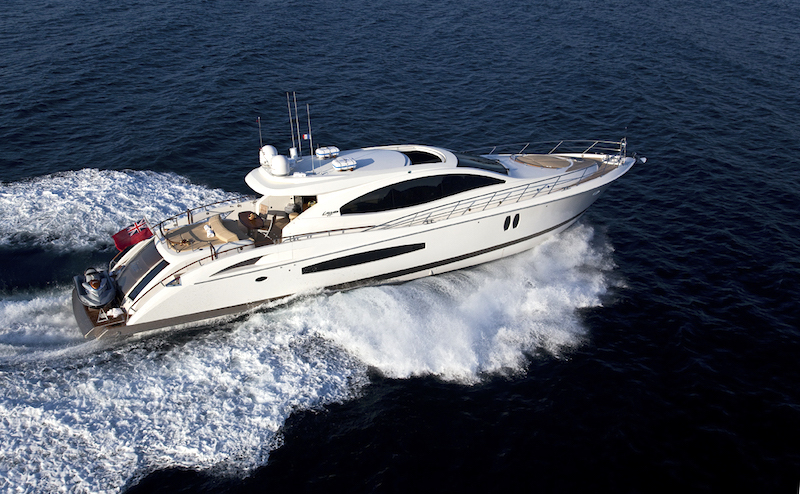 Book your yacht with a charter broker specialising in the French Riviera. They will help you plan the perfect Cote d’Azur yacht charter itinerary and use their local knowledge and contacts to secure the best berths and get you reservations at all the best beach clubs and restaurants. Those looking for the ultimate Côte d’Azur holiday often choose to rent a villa in the Golf of St Tropez. This area encapsulates what the French Riviera is all about, from the superyachts and restaurants in the Port of St Tropez to the legendary beach clubs at Plage de Pampelonne, a luxurious villa makes the perfect base to experience all that the area has to offer. The best villas are located in St Tropez itself or in nearby Ramatuelle, Pampelonne, Gassin or La Croix Valmer. It goes without saying that these villas do not come cheap, but there are villas available at all price points. Consider renting in June or September to get the best deal. These months either side of the High Season are the perfect time to holiday on the French Riviera with great weather but without the huge crowds found in the major holiday months of July and August. 3 of The Best Restaurants in Monaco! The Principality of Monaco is one of the most popular ports of call on any south of France yacht cruise. This tiny country is renowned as one of the most glamorous yachting destinations in the Mediterranean and fans of gastronomy will not be disappointed, with everything from 3 Star Michelin cuisine to simple hearty Mediterranean food on offer in Monaco’s restaurants. Monaco is home to some legendary restaurants including the 3 Star Alain Ducasse at the Hotel de Paris in Casino Square and the 2 Star Joël Robuchon at The Metropole in Monte-Carlo. In this article, we are going to focus on three of the best restaurants in Monaco which we highly recommend visiting when in town on a luxury yacht charter! The Blue Bay is located in the Monte-Carlo Bay Hotel and Resort on Avenue Princesse Grace in the Larvotto beach area of Monaco. Whilst this large hotel very much has a Vegas feel to it, this restaurant has a relaxed atmosphere and is something of an oasis of calm in the middle of Monaco. 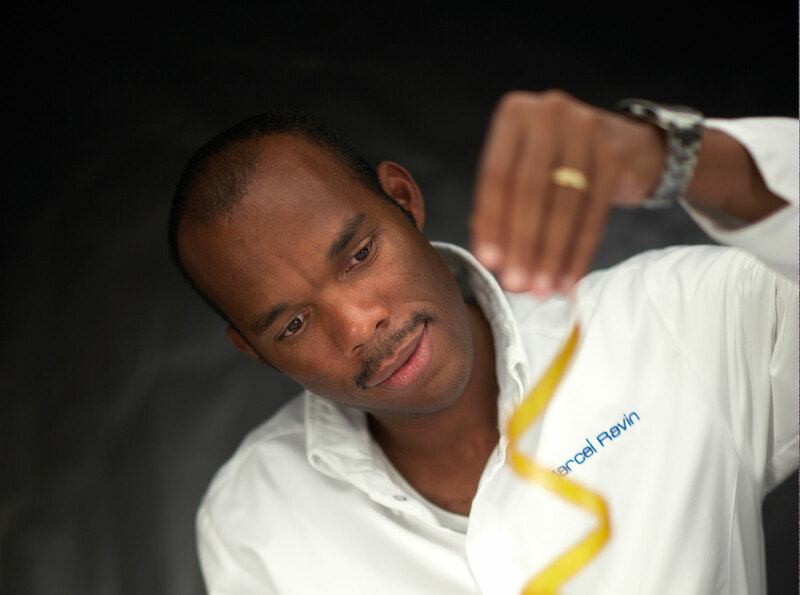 Chef Marcel Ravin hails from Martinique in the French Caribbean and has brought to Monaco his unique take on traditional French cuisine with strong Caribbean and Asian influences. Delightful flavours abound and the style of cuisine is perfectly suited to Monaco’s hot summers. Standout dishes include Foie Gras with Candy Flos and a dessert of Dim Sum made with tropical fruits! Ravin’s cuisine has received universal acclaim since the restaurant opened and he has been awarded one Michelin Star! The interior is stylish, light and airy but the most coveted tables are on the terrace and offer stunning views over the Mediterranean. Blue Bay offers surprisingly good value for Monaco with exquisite tasting menus available from €88 per person. Watch the wines though as they can do some serious damage to the wallet! Venice comes to Monaco via Mayfair and New York City… Cipriani offers classic Italian cooking in a fun and wonderfully glamorous atmosphere. Arriving at this restaurant, you will be greeted by a parade of Bugattis and Bentleys being dropped off with the valet by ultra chic diners. The menu will be instantly recognisable to anyone that has visited a Cipriani restaurant before. Standout starters include the stellar King Crab Salad and the delightfully simple “Pasta e Fagioli”. Mains are all the Italian classics, fantastic grilled fish, meat and of course truly exceptional pasta! You have not lived until you’ve tried “Tagliardi with veal ragù”! The dessert menu is delivered “live” at the table with all the sweet delights paraded around your table in a swirl of waiters’ arms! This is Italian restaurant theatre at its’ best and it works very well in Monaco! Cipriani Monte-Carlo is owned by the equally flamboyant Flavio Briatore, one time owner of the Benetton F1 team and longterm resident of Monaco. Briatore also owns the excellent Twiga nightclub nearby and it is here that many diners head to after dinner at Cipriani. Located under the tunnel that you’ll instantly recognise from the Monaco Grand Prix, Twiga offers a fantastic waterfront location to enjoy a glass or six of champagne and sets from the world’s superstar DJs, the glimmering lights of assembled superyachts providing a stunning backdrop! Twiga is without a shadow of a doubt the best nightspot in the Principality of Monaco! Cosmopolitan is an excellent restaurant in the vibrant Rue du Portier area of Monaco. This delightful establishment utterly disproves the theory that it is impossible to eat in glamorous surroundings in Monaco without breaking the bank! Cosmopolitan is owned by an Italian/British couple and that is reflected in reflected in the menu, superb Squid Ink Pasta sits comfortably alongside Roast Beef and Fish and Chips! The food is consistently good and offers exceptional value for money in this prestigious location. Guests can dine either inside in a modern, funky interior or outside on a fabulous terrace enjoying the parade of supercars that are a constant feature in this street! This restaurant has very sadly now closed! The glamorous Principality of Monaco and the stunning perched village of Eze are two places everyone should visit when holidaying on the French Riviera! From the glitz of Monaco’s Casino Square to the stunning food on offer at Chateau de la Chèvre d’Or in Eze, these two destinations have plenty to offer even the most discerning of travellers. Discover The Best of Monaco & Eze in this article from Bespoke Yacht Charter. The French Riviera is renowned for its exclusive lifestyle consisting of grand villas and luxury superyachts. However, it wasn’t always the attractive destination it is nowadays. Dating back to the Middle Ages, there have been numerous rivalries, battles and wars. Therefore, a selection of fortresses and castles were constructed at the peak of many of the perched villages to protect the region. These strategic fortifications offer an insight into the French Riviera’s history and culture and provide some of most awe-inspiring panoramic views along the dramatic coastline. Rent a luxury supercar and explore the best defensive fortresses in the region whilst driving one of the world’s finest coastal routes in style. Ferrari always seems to be the most popular option in the region. Begin your driving tour along the French Riviera in Mandelieu La Napoule, a beautiful unspoilt coastline resort situated east of Cannes. The 14th century castle is a famous landmark in the region, which looks onto the beautiful Golfe de la Napoule. It has a fascinating history stretching back over hundreds of years. Constructed in 1387 by the Countess of Villeneuve, it stood for many years as a medieval fortress. However, after being dismantled and transformed into a glass factory during the French Revolution in 1789, the castle was bought and restored by American artist and sculptor Henry Clews and his wife Marie. Henry focused on the architecture of the castle and his wife designed the impressive gardens. The castle is now open to the public under the management of The Henry Clews art foundation and Henry’s collection of art is on display to visitors. The next destination is Villeneuve-Loubet. Take your supercar rental for a magnificent coastal drive through the prestigious cities of Cannes and Antibes until you reach Villeneuve-Loubet, a historical, traditional town sitting on the hillside with stunning panoramic views of the Mediterranean. Constructed in the 13th century by the Romée of Villeneuve, this historic medieval fortress boasts an incredible history, experiencing war, occupation and revolution. Owned by the Panisse-Passis family since 1741, the castle has been inhabited, maintained and is now open to the public. Surrounded by immense gardens, the 33m watchtower offers a picturesque view of dramatic coastline. A short drive and you will arrive at the next historic castle, in the beautiful perched village of Cagnes-Sur-Mer. Towering over the small historic town, this ancient stronghold was built in the 1309 by Rainier Grimaldi, Lord of Cagnes-Sur-Mer, and transformed into a Baroque-style palatial home in 1620. At the summit of the hill, featuring grand towers and a triangular courtyard, this castle offers spectacular views of the Mediterranean Sea. These days, the castle hosts a variety of international contemporary art exhibitions and also has a museum of modern art. An absolute must-visit on your French Riviera road trip! The final castle on this driving tour is in the ancient commune of Eze. In the traditional hilltop village, within the old fortress walls and amongst the ruins is the luxurious Chateau de la Chèvre d’Or. Featuring breathtaking views of St Jean-Cap Ferrat and the Med, resides a world-class hotel with many terraces and a deluxe swimming pool. Enjoy an exquisite meal in the courtyard and watch the sunset on the horizon. To finish the evening in style, drive round the winding roads into Monaco, taking in the phenomenal views. To round off an ideal day, pull up in front of the world famous Monte Carlo Casino, in your Ferrari rental and enjoy an exclusive evening in Monaco. Check out this great footage of Monaco filmed from a drone. Featuring the beaches at Larvotto, Casino Square, the Hotel de Paris, Superyachts in Port Hercule, Monte-Carlo Beach Hotel and everything else that the Principality of Monaco has to offer! St Tropez on the French Riviera remains for many the quintessential luxury yacht charter destination in the Mediterranean. Every summer, luxury yachts on charter fill the Port of St Tropez. St Tropez is so popular with luxury yachts, that in July and August, there are often many hundreds of yachts anchored in the bay outside the port and at nearby Pampelonne beach. Berths inside the Port of St Tropez are like gold-dust and those wanting to visit St Tropez on their luxury yacht charter need to book many months in advance in order to guarantee that all important berth inside the harbour. St Tropez offers it all to guests holidaying on a luxury yacht, great beaches, restaurants, shopping and nightlife but beautiful quiet anchorages are only a short cruise away! Since it rose to fame in the 1960s, St Tropez has remained the ultimate summer playground for the world’s jet-set, and despite competition from other destinations around the Mediterranean, St Tropez shows no signs of relinquishing its’ crown! Monaco GP gets off to a slippery start! The F1 circus is set up and ready to go for another great round of racing in what is perhaps the most eagerly awaited race of the season – the 2015 Monaco Grand Prix. Following huge thunderstorms overnight, track temperatures had dropped significantly from yesterday and this morning saw drivers tentatively easing their cars around the circuit in damp slippery conditions. All except Lewis Hamilton who flew around his local track as if conditions were perfect. He was a massive 4 seconds faster than the rest of the pack, until the tarmac dried out a bit and the other drivers gained their grip. This afternoon saw more downpours and loyal fans sadly didn’t get to see much action as the rain set in. However, the end of the session still has Hamilton as the fastest driver with Max Verstappen in the Toro Rosso second fastest in his first time around this demanding track. Daniel Ricciardo was third fastest in his Red Bull, followed by Vettel for Ferrari and then the second Toro Rosso of Carlos Sainz. Pastor Maldonado had a great first run finishing sixth, ahead of the second Red Bull driven by Kvyat who was followed by Kimi Raikkonen in the second Ferrari. 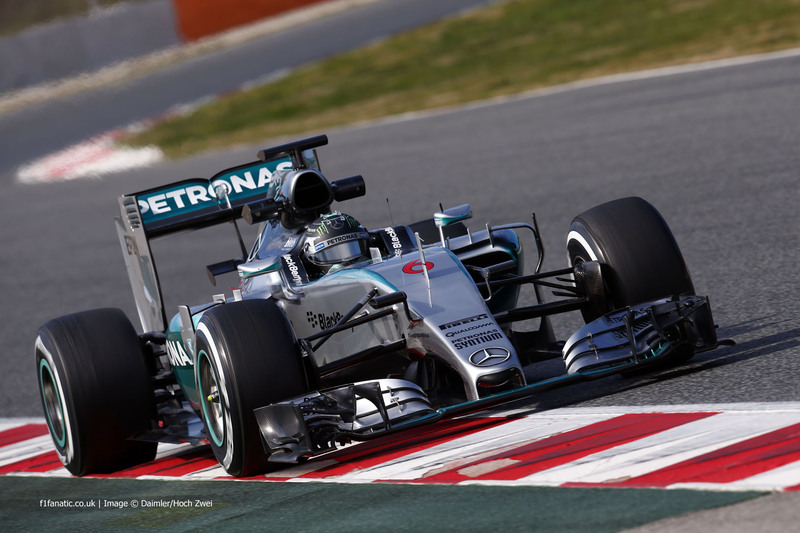 Nico Rosberg or Mercedes finished the session in 9th with Felipe Massa completing the top ten. Great news for McLaren with Fernando Alonso and Jenson Button ending the session 11th and 12th fastest, after a troubled start for Jenson. With many yacht guests already installed, this evening will be a more sedate affair as guests take time out to relax, head in to town for dinner and soak up the electric Monaco GP atmosphere whilst yachts and clubs prepare for tomorrow evening’s kick off to the biggest party weekend of the year! Things are excitingly poised for the 2015 Monaco Grand Prix in just under two weeks following Nico Rosberg’s victory in Barcelona at the weekend! Reigning World Champion Lewis Hamilton finished second with Sebastian Vettel in the resurgent Ferrari in third place. 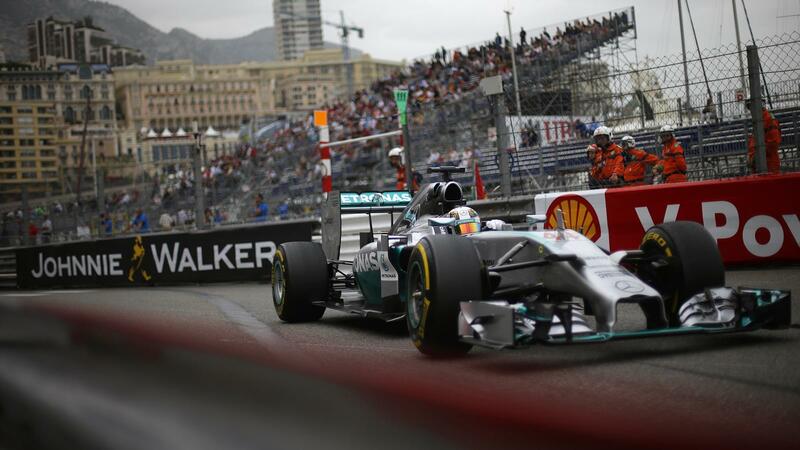 With three wins to his name so far this season, Hamilton leads the Championship on 111 points. Rosberg is on 91 points and Vettel in third on 80 points. Following the drama last year in qualifying where Hamilton’s fast lap was cut short as Rosberg went off the circuit, the British driver will be keen to dominate qualifying and secure that ever important pole position in Monaco! It is notoriously difficult to overtake on the streets of the Principality of Monaco and securing pole goes a long way to ensuring victory. The world’s first all electric racing series comes to Monaco next weekend. 20 cars and drivers from the FIA Formula E series will take part in the inaugural Monaco ePrix on a shortened version of the legendary Monaco Grand Prix circuit featuring such infamous corners as Tabac, Rascasse and the Swimming Pool. The event forms part of the 2014/2015 Formula E championship, which aims to bring electric power to the forefront of motorsport. The series is already causing a great deal of excitement in the motor racing world. Formula 1 already makes extensive use of electric power and perhaps it is only a matter of time before the pinnacle of motorsport also relies totally on electric power! Monaco will be the seventh race of a total of ten, races having already taken place in such places as Beijing, Miami and Buenos Aires. The drivers must be incredibly excited at the thought of getting to drive their incredible electric machines capable of speeds in excess of 220kmh on the famous Monaco street circuit!